Keeping your house pet friendly is critical to the health and wellness of your pets. Just what does pet friendly mean? A pet friendly house is a sheltered location for an animal to live, play and relax that is clean, safe, free from hazards and toxic materials. Most pets share house space with their owner. Household items used in a house by an owner are available to the pets. Many of these materials used by owners can be unsafe or deadly to pets. "Properly storing and locking up hazardous items is the first step to preventing accidental poisonings," advises Janet Tobiassen Crosby, DVM in Common Household Poisons. If you haven't made your house pet friendly, do it now. It will be easiest to move from one room to another checking closets, cabinets, boxes, shelves, and drawers. Yes, drawers - adept, curious pets can easily get into them! "Not only can a poisoning incident be life-threatening for the pet, it's traumatic for the pet owner," said Carol McConnell, DVM, vice president and chief veterinary medical officer for Veterinary Pet Insurance. "We recommend that pet owners be aware of which items around their homes can be harmful to their pets-medications, insect poisons, chocolate and certain nuts-and keep these items safely out of reach. They shouldn't assume that their pets will ignore that bottle of bleach in the laundry room or the Philodendron plant by the window. Our data shows this just isn't so." It could be a good idea to isolate your pet for a few minutes while you remove and secure substances that can be harmful. Pets may enjoy chewing through storage containers you consider safe. Remember that child-proof does not mean pet proof! Common Household Poisons by veterinarian Janet Tobiassen Crosby suggests properly storing and securing items that can harm your pet. Ensure that they are stored up high and out of reach of all pets (and children) in your home. Your pet doesn't know ingesting these items can harm or kill them. These items are used to maintain your home, the furnishings, and items in it. They may be located in your laundry room, kitchen, bathrooms, or garage. Secure abrasives, soaps, waxes, disinfectants, powders, aerosol and pump sprays, paints, lubricants, bleach, fabric softeners, and water softener supplies. In addition to storing where pets cannot reach or gain access to these items, use only the recommended doses. Always follow the dosing schedule. Pets can be attracted to this sweet tasting, brightly colored liquid. "One swallow may be lethal for small animals," Crosby advises. These are baits you're using to attract pests and they can also attract your pet! Beware. "One of the most common household poisons are medications - either discovered by the pet or purposely administered by the owner," Crosby says. Your veterinarian must guide you with giving any medications to your pets. Over-the-counter and prescription drugs require authorization from your veterinarian. "Accidental poisonings, especially from NSAIDs are very common," she says. Xylitol is an artificial sweetener that can be toxic to animals. It is often found in foods labeled as "sugar free." Chocolate, caffeine, raisins, and grapes are known toxins for pets. "The sheer mix of items in a trash can (may) make a pet owner forget the combined potential hazard," alerts Crosby. 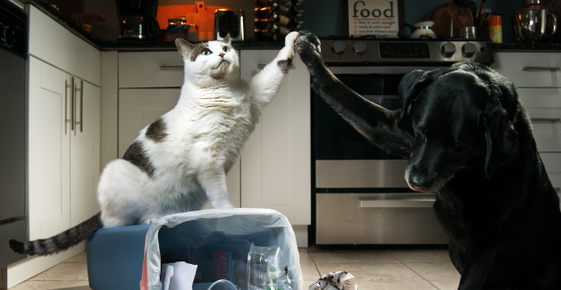 Cleanser containers, food scraps, broken and sharp objects could severely harm a pet who wouldn't usually bother a trash can. "Make sure your trash is secure." Crosby, Janet Tobiassen, DVM. Common household poisons. Crosby, Janet Tobiassen, DVM. Top 10 pet poison prevention tips.